Matthew A. Wright, BA1, Arash Samadi, BS1, Daniel O. Lara, BS1, Alexandra Stern1, Ashritha Bheemidi1, Alexandra J. Lin, BA1, Sarah J. Karinja, MD1, Sudip Mukherjee, PhD2, Omid Veiseh, PhD2, Jason A. Spector, MD1. 1Laboratory of Bioregenerative Medicine and Surgery, Weill Cornell Medical College, Department of Surgery, Division of Plastic Surgery, Cornell University, New York, NY, USA, 2BioScience Research Collaborative, Department of Bioengineering, Rice University, Houston, TX, USA. Introduction: Capsular contracture (CC) remains the most common complication of prosthetic-based breast reconstruction. In women who undergo adjuvant radiation therapy either before or after implant reconstruction, the risk of contracture may be as high as 50%. Treatment for symptomatic contracture mandates revision surgery - a source of significant morbidity. Despite the ubiquity of this problem, there remains a paucity of effective techniques to prevent or treat CC. The aim of this study is to examine the effect of E9 - a novel, non-toxic small molecule known to have potent anti-inflammatory effects - on peri-prosthetic capsule formation when covalently bonded to smooth round silicone breast implants in a rodent model of alloplastic breast reconstruction. Methods: Twenty-four female Sprague Dawley rats were used in this study. Each animal had 2cc smooth silicone breast implants from Mentor Corporation implanted bilaterally under the panniculus carnosus on the dorsum. Twelve received uncoated implants and twelve received implants coated with E9. Half of the animals from each group received 20 Gray of targeted radiotherapy on postoperative day ten. One and three months after implantation, the tissue surrounding the implants was harvested for analysis of capsular histology. Capsule thickness was measured at 5 different locations per implant in a blinded fashion, and the Mann-Whitney test was used to compare median capsule thicknesses between groups. Finally, microCT scans from the day of implantation and the day of sacrifice were qualitatively analyzed for morphology. 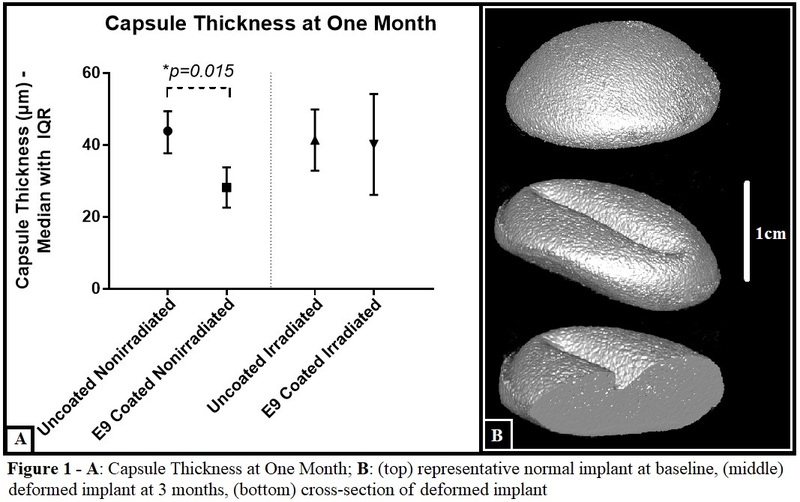 Results: Median capsule thickness in nonirradiated rats with E9 coated implants was significantly thinner (25.95 μm, IQR: 23.86-34.48 μm) than rats from the uncoated, nonirradiated group (43.91 μm, IQR: 37.72-49.44 μm; p=0.015) (Figure 1a). Median capsule thickness in irradiated rats with E9 coated implants (38.93 μm, IQR: 26.95-56.18 μm) was not significantly different when compared with the uncoated irradiated group (43.39 μm, IQR: 31.85-49.45 μm; p=0.82). MicroCT scanning revealed little to no change in capsular morphology in most of the rats sacrificed at one month, though morphologic changes suggesting CC were observed in one rat from the three-month uncoated irradiated group (Figure 1b). Of note, complete three-month capsular thickness and morphologic data are still pending. Conclusions: E9 coating of smooth silicone breast implants significantly reduces capsule thickness in nonirradiated rats at one month postoperatively. This technology holds significant promise for reducing capsular contracture in women with alloplastic breast reconstruction.